Today is one of the reasons I decided to do Inktober. When inspiration isn't struck immediately, sometimes you need a little push. And sometimes, that push is straight off a cliff. Today's prompt does just that. Day 5 of Inktober is "chicken". WTF do you do with "chicken"? I thought about several things, mostly relating to food. Then I thought about being funny with "which comes first", but couldn't figure out how to translate that. But that got me thinking about eggs, so here's what I came up with! 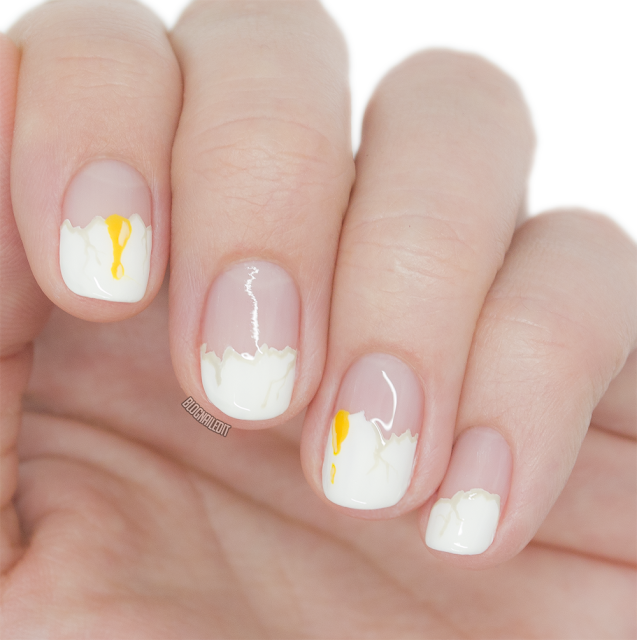 My ooey-gooey egg nail art is done with all OPI polishes today. The white egg is Alpine Snow, its cracks are Skull & Glossbones, with the yoke made up of The "It" Color with Towel Me About It accents for sheen. 5 days down, 26 more to go! Let me know if you're participating, I'd love to see your ideas!